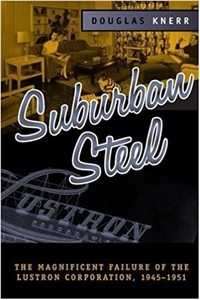 Suburban Steel chronicles the rise and fall of the Lustron Corporation, once the largest and most completely industrialized housing company in U.S. history. Beginning in 1947, Lustron manufactured porcelain-enameled steel housed in a one-million-square-foot plant in Columbus, Ohio. With forty million dollars in federal funds and support from the highest levels of the Truman administration, the company planned to produce one hundred houses per day, each neatly arranged on specifically designed tractor-trailers for delivery throughout the country. Lustron's unprecedented size and scope of operations attracted intense scrutiny. The efficiencies of uninterrupted production, integrated manufacturing, and economies of scale promised to lead the American housing industry away from its decentralized, undercapitalized, and inefficient past toward a level of rationalization and organization found in other sectors of the industrial economy. The company's failure marked a watershed in the history of the American housing industry. Although people did not quit talking about industrialized housing, enthusiasm for its role in the transformation of the housing industry at large markedly waned. Suburban Steel considers Lustron's magnificent failure in the context of historical approaches to the nation's perpetual shortage of affordable housing, arguing that had Lustron's path not been interrupted, affordable and desirable housing for America's masses would be far more prevalent today.